Home News Get yer skates on! 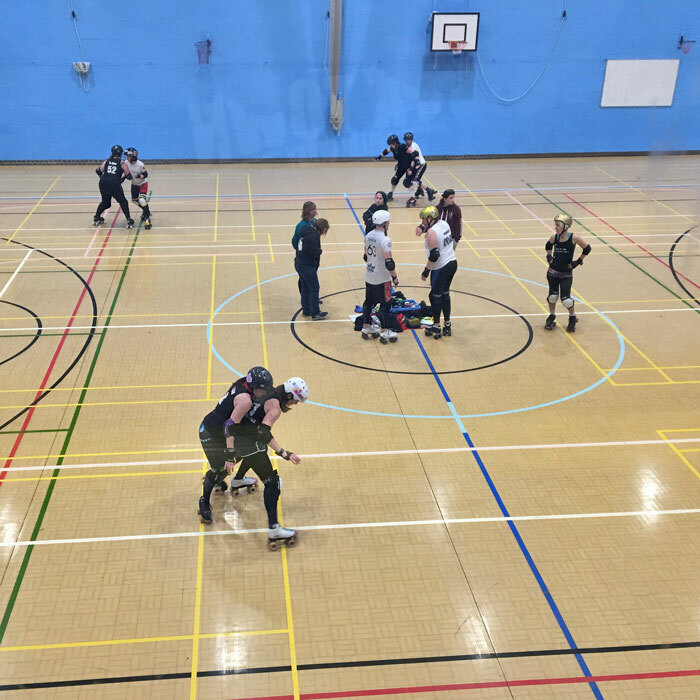 Northern Life's roving reporter Jim Coulson attempts roller derby in Yorkshire, Europe's fastest growing female sport. Everyone is fully aware of the prim and proper exterior of Harrogate. Afternoon teas at that quintessentially Yorkshire phenomenon, Bettys; dinner at the local branch of London’s notorious celebrity hangout The Ivy; pampering at the opulent Turkish Baths and all that jazz. But there is more to this North Yorkshire spa town than that. 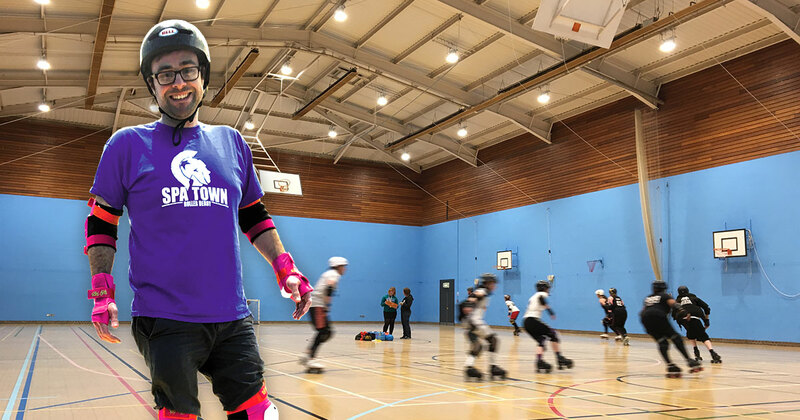 Harrogate is also home to a band of fiercely competitive, hard-hitting women with an array of pun names who compete in Europe’s fastest growing female sport – roller derby. And it’s not just Spa Town Roller Derby flying the flag for the White Rose County; the sport is a big deal all over this part of the world. From Hull to Halifax and Scarborough to Sheffield, Yorkshire teams regularly take to the oval track in sports centres across the country, thrilling evergrowing audiences with a game that has been described as ‘British Bulldog on roller skates’, but which is much more exciting than that. It’s fast, it’s frantic, it can be brutal, and Spa Town invited me along to give it a go. The basic premise is that two teams each field a set of five players on quad roller skates. These consist of one jammer for each team, who is the player who scores points based on how many opposition players they pass during each two-minute ‘jam’, and four blockers each, who attempt to stop the opposing jammer passing using their bodies. They play for two halves of 30 minutes each, with the top point-scoring team declared the winner. The sport originated in America in the 1930s, but it disappeared from public consciousness for decades until a grassroots DIY movement in Austin, Texas sparked a resurgence in the early 2000s. Groups of (mainly) women rebuilt the game from the ground up, developing a culture and social scene to go with it. The excitement of this underground sport spread quickly, and now teams have sprung up around the world. Many participants take on skater names, often puns based around their own name, popular culture and sometimes to do with the tough nature of the game. Some of my favourite examples include Toulouse le Threat of Sheffield Steel Rollergirls and Rainy City Roller Derby’s Jessica Mennis. The third Roller Derby World Cup landed in Manchester in February 2018, featuring 38 teams from around the globe. The USA retained their title, with Team England finishing fourth. This sense of community permeates the whole game. Spa Town worked with Leeds rock band Hope&Social in the run up to the Tour de France Grand Depart in 2014. The band’s tour of outdoor concerts in towns along the Yorkshire route was powered by cycle generators, culminating in a performance at the official launch show at Leeds Arena in which a parade of skaters joined them on stage. 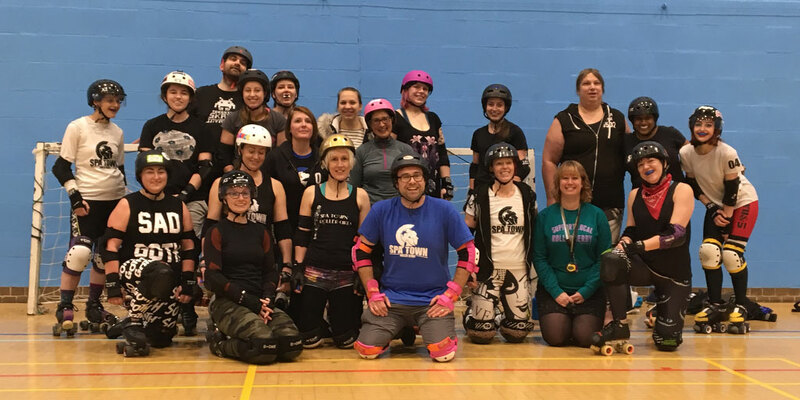 Roller derby teams were also heavily involved with the lotteryfunded This Girl Can campaign, aimed at encouraging women to become more active. Of course, this fun and friendly community sounds great, but is it worth flinging yourself at speed towards another fast moving athlete whilst both on precarious skates in order to experience? Especially bearing in mind that players can, and do, break bones in the process. Well, the answer appears to be a resounding ‘yes’. I arrived at Harrogate Ladies’ College for my taster session with some trepidation. I am an out-of-shape, almost 40-year-old man with limited balance and who is sleep deprived thanks to a teething 20-month-old. I also can’t skate. But the comforting words of Gem from York Minxters rang in my ears: “as an adult it was reassuring when most people are starting with no prior experience and you know that your role models have done the same”. Perhaps I would suddenly discover that this was the sport I was destined to play. What if it turns out that I was the Cristiano Ronaldo of roller derby all along and never even realised it? This might be my one true calling! After five minutes of scrabbling about like Bambi, I eventually managed to stand up. The game looks fast when you are sitting on the sidelines, taking it all in. However, it seems so much speedier when you are edging along at the pace of a hungover tortoise and the real players are flying around either side of you. Plus, bear in mind that this was just them warming up for a training session. 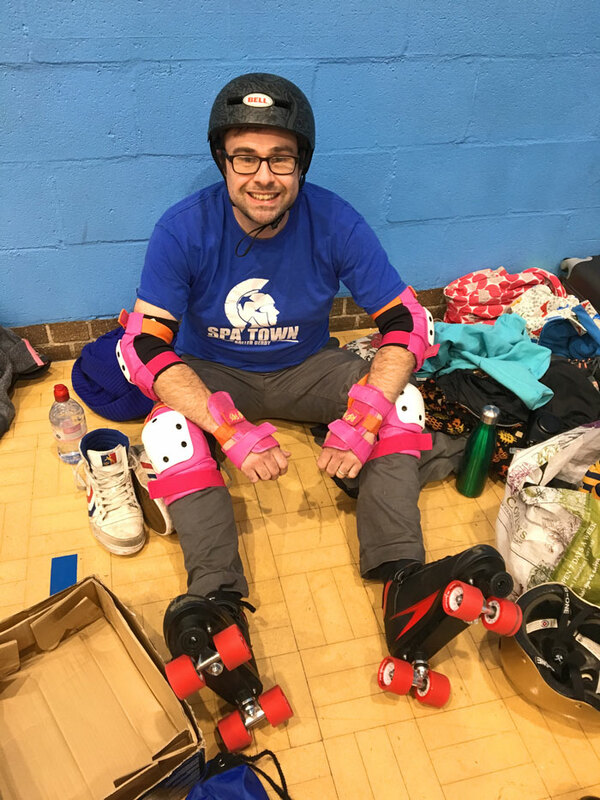 I think the moment I truly realised that roller derby was not my forte was when it became obvious I couldn’t actually turn corners on skates. Going straight ahead, I was adequate, but that was the extent of my repertoire. It’s not ideal for a game played on an oval track. In addition, I could only stop by holding my hands out and using the wall as a brake. Having skated, if you can call it that, the next stage of my derby initiation was to take a hit or two. If you want to experience roller derby, it’s fairly essential. Ron Wheelsly and Jilling in the Name Of obliged, thankfully pulling their punches somewhat, although it was enough to convince me that I should not attempt to stay up straight whilst speeding round a track any time soon. Roller derby is a fantastic game to watch, but I’ll leave it to those with a little more coordination to play it. It’s a sport where the actual game is only a small part of the appeal. The sense of family and community is evident whether you play or watch, and that helps explain its huge appeal across Yorkshire.